There are numerous alcoholic beverages popular in Korea aside from its traditional liquor soju. 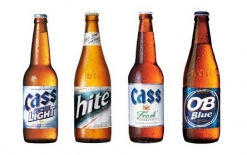 The top 3 popular beers (mekju) are Hite, Cass and OB Lager. The Hite brewery is the largest of the South Korean brewers, brewing 9 different beers including but not limited to Hite, Hite Prime, Hite Stout, Hite Exfeel (light, low cal beer) as well as being the local maker of Fosters and Carlsberg. The popular 4.5% Hite is a micro filtered lager that has a fresh taste which also is the first beer to include a thermometer mark on its label. Cass Breweries was taken over by Oriental Breweries in 1999 which the company primarily makes OB Lager and Cafri Premium Lager. Cass beers are 5.0% lagers which are one of the top 3 most popular beers in Korea. Sold bottled or on tap, it’s a fairly pale lager reminiscent of many Asian beers. This 4.7% Lager has a light golden color and a flavor reminiscent of many Asian beers that use rice grains. Owned by Oriental Breweries, there are 3 other types of OB beers, including a 4.4% new lager and light (low cal) as well as a non alcoholic OB variety. Oriental Breweries also makes the 4.0 % Cafri premium lager. Fact: The legal drinking age in Korea is 19 years old.